Last night I was in the mood for cake but I didn’t want something with a lot of calories, so I poked into one of the cookbooks that I found on my Portland trip: 1,001 Low-Fat Vegetarian Recipes (found on the discount shelf at Powells, natch). This cake may be low in fat, but it’s got lots of sugar, but I decided to throw caution to the wind cuz dammit, I wanted cake! And boy, this cake was worth it. Spicy and moist and it almost tasted like a spice donut! Yum. I wasn’t too sure about the frosting, because as I naturally tend to do, I don’t really follow recipes to the letter and mine turned out to be more of a glaze than a frosting. But the glaze worked well and I added some cinnamon to give it more flavour, but I did find that the recipe did make too much icing. Next time, I’d cut it in half or even leave it out altogether, and the cake wouldn’t suffer one it without it. 1. Beat margarine, sugar, egg & vanilla in a large bowl until smooth. Mix in combined flour, baking powder, salt and spices alternately with milk, beginning and ending with the dry ingredients. Pour into a greased and floured 8 or 9 inch round cake pan. (I used a bundt pan). 2. Bake at 350 degrees until cake is browned and springs back when touched, about 40 minutes. Cool in pan for 10 minutes and then remove and cool to room temperature on a wire rack. 3. 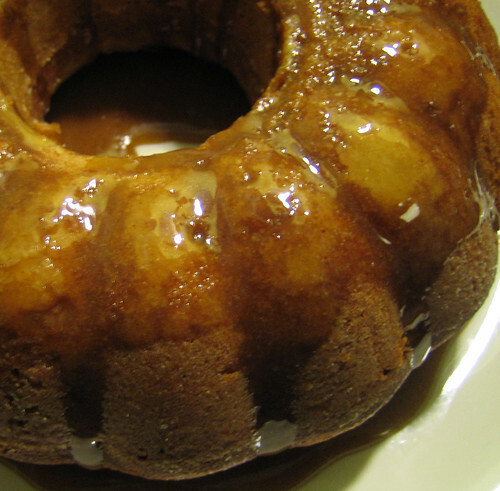 Place cake on serving plate and glaze with Penuche Frosting. 1. Melt margarine in a medium saucepan; stir in brown sugar and heat until bubbly. Stir in powdered sugar, vanilla and cinnamon and enough milk to make a spreading consistency.